Are you designing a nursery? If yes, then we totally understand the turmoil that you are going through. You have to pick and choose between several products to actually reach a conclusion. It can get frustrating to look into so many catalogs without liking a single product. The main problem lies in the fact that baby furniture tends to be pricey. It doesn’t fall under the capability of the young parent or the first time parents. An important thing that they have to get is a diaper changing station. If they choose something like the South Shore Peak-a-Boo Changing Table with Drawers then they can get a nice one with lots of storage. So, let us read a little about this changing table and dresser combo. GENEROUS STORAGE: The piece boasts 2 spacious drawers, 1 open space, and 1 adjustable shelf behind a cabinet door. CONTEMPORARY ELEGANCE: Fresh clean lines and a stylized kickplate make this piece a neutral addition to your nursery. STURDY AND COMFORTABLE: The profiled edges make it comfortable and secure for your baby - can support up to 30 lbs. This changing table/dresser combo somehow feels more compact than similar models with removable changing tables. A similar model to this one, with slight design changes, is the Cotton Candy collection changing table. Way more different changing table models can be found in our buying guide, in case this Peek-A-Boo model doesn’t seem perfect. The material of the furniture is Composite Wood Panels and it has a certification from the Forest Stewardship Council. The product comes with spacious drawers with knobs on them. The edges of the changing table are profiled to protect from injuries. One will need to assemble the product after it reaches them. The dimensions of the product are 47×20×41 inches. The weight of the item is 116 pounds. The company provides 5 years warranty on the product. It comes in a clean white color. Even though the material is a composite board it is definitely sturdy. The drawers are quite spacious so that you store an ample amount of things in it. The changing station also has a nice amount of space so that the baby is comfortable. The height of the changing table is quite good for all adults. Assembly isn’t a problem if you follow the instructions correctly. The edges have been rounded so that no injuries take place. The warranty of 5 years is a great addition as it is often missing in case of baby furniture. The price is also quite affordable for the space that it delivers to the parents. It doesn’t come with the changing pad. The product is only available in one color. Some customers have got damaged products. Composite boards aren’t really great for places with huge amounts of moisture. 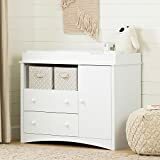 In conclusion, we can say that the South Shore Changing table with drawers is nice for parents who are on a budget and want something friendly for their baby. They will get a quick delivery and they can assemble the product quickly before the baby arrives. With proper care, the table will definitely last a long time. So, if they were looking for something similar then they can definitely buy it.